In Dawson v. Florida Department of Highway Safety and Motor Vehicles (4D09-743), the judges from the Third District sat as associate judges on the Fourth District and affirmed the suspension of a drivers license for one year. On July 14, 2008, the petitioner-defendant was convicted of "Driving While Ability Impaired" ("DWAI") in Suffolk County, New York pursuant to New York Vehicle and Traffic Law section 1192(1). The petitioner’s driver’s license was suspended for 90 days and he was fined $480.00. On August 27, 2008, the Florida Department of Highway Safety and Motor Vehicles (the "Department") revoked the petitioner’s Florida driver’s license for one year based on the New York conviction. After his license was suspended for one year, the petitioner filed an appeal in the circuit court which was denied by an appellate panel. The petitioner then filed a petition for certiorari in the Fourth District, which disqualified itself because a close relative of the petitioner works for that court. 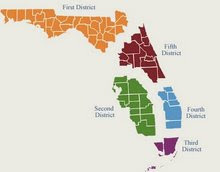 After the Fourth District disqualified itself, three judges on the Third District were assigned to sit as associate judges of the Fourth District for purposes of this case. The court addressed two of petitioner's claims on appeal. The court rejected the first claim that the New York statute has different elements than its Florida counterparts. Under section 322.24, the Department may suspend or revoke a license when the out-of-state conviction is an offense which, "if committed in this state, would be grounds for the suspension or revocation of his or her license." This means that the statutory elements of the out-of-state conviction must satisfy the statutory elements of the Florida crime...All of the elements of the New York statute are included in its Florida counterpart. The appellate division properly denied the petitioner relief. The petitioners second argument was that his due process rights were violated when he was not provided a preliminary hearing. The Third District rejected this argument as well citing to "Dept. of Highway Safety & Motor Vehicles v. Davis, 775 So. 2d 989 (Fla. 1st DCA 2000) (entry of an order revoking driving privileges without prior notice or opportunity to be heard did not violate due process clause because the driver could have requested a hearing upon receipt of revocation and the Department would have been required to hold such hearing within thirty days of its receipt of the request)."